Even though turquoises are relatively inexpensive semi-precious gems, many royal families do not own significant pieces of turquoise jewelry, let alone tiaras featuring turquoises. But this tiara, once in royal hands and now owned by Danish nobles, combines turquoises with stars. We've got a rather surprising winner in the weekly jewel review this week. Vote for your favorite in the poll below! 10. Princess Charlene of Monaco donned a sparkling pair of stud earrings during a ceremony in honor of Monaco's patroness, Sainte Devote, on Tuesday. With all the chatter surrounding the Cambridges' upcoming Indian tour, I thought it would be appropriate to look back half a century at another important visit to India: Queen Elizabeth II's first trip to the country. Which jewels can you spot on the Queen during this historic visit? Sotheby's in London has released a "first look" at an important upcoming sale: the auction of a number of the possessions of the late Duchess of Devonshire. Here's a look at some of the jewelry items that will be offered in the March sale. Some wedding tiaras are statement makers, and some are a bit quieter. Today's tiara, the diamond wedding tiara of Princess Claire of Belgium, falls into the latter category, but for my money, the piece is still one of the best bridal tiaras worn in Europe this century. The specific provenance of the all-diamond tiara doesn’t seem to have been made public knowledge. 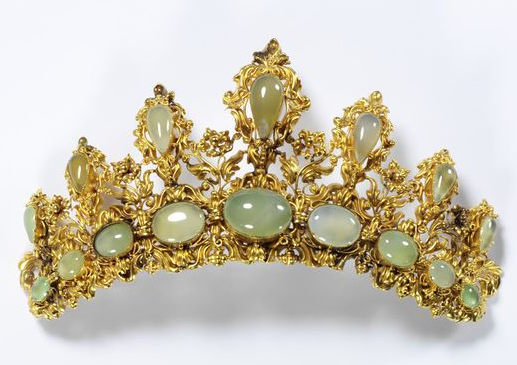 While we don’t know whether the tiara was newly-made or an antique piece, we do know that it was a wedding gift to the British-born Claire from her new parents-in-law, King Albert and Queen Paola of Belgium. From jubilees to circus festivals, we've got a treasure trove of jewelry on display this week. Don't forget to vote for your favorites in the poll below! 10. Princess Charlene of Monaco exercised the privilege du blanc when she visited the Vatican this week, and you could just see a glimpse of pearl stud earrings peeking out from under her white lace veil. The royal jewels from Norway just keep coming this week! 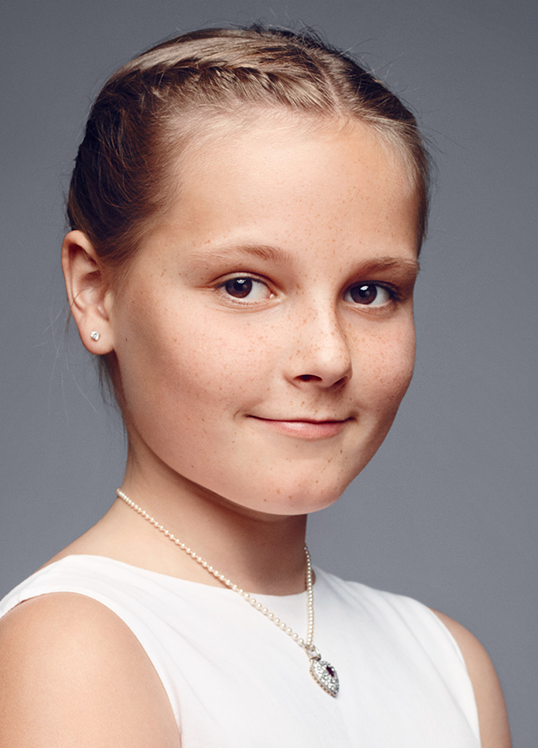 Today is Princess Ingrid Alexandra's twelfth birthday, and the Norwegian royal court released a new set of portraits for the occasion. In the pictures, the future queen wore a piece of heirloom jewelry that belongs to her: a pearl necklace with a diamond and ruby heart pendant. 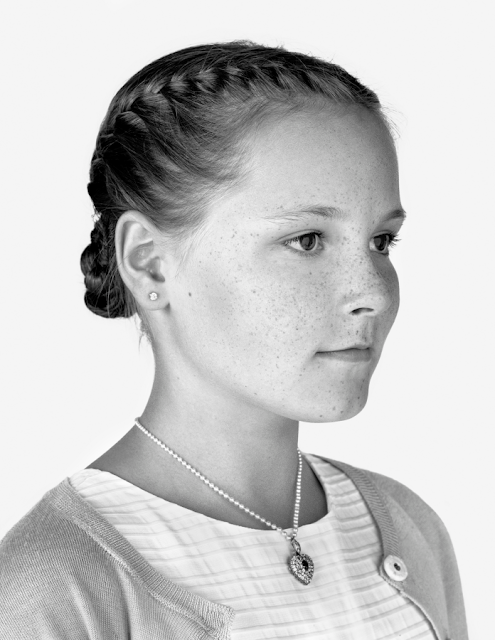 The necklace was a christening gift to the princess from her grandmother, Queen Sonja. Sources have suggested that the necklace was originally a gift to Queen Sonja from her husband, King Harald, on the occasion of the christening of Ingrid Alexandra's father, Crown Prince Haakon. To my knowledge, though, the court has never clarified the precise provenance of the necklace. 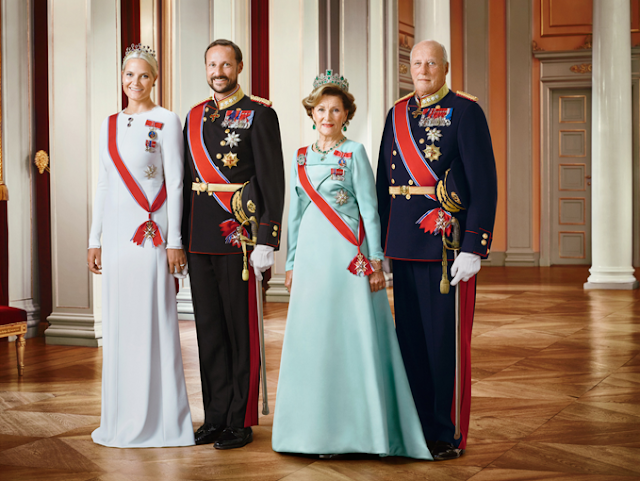 The piece has also been worn by Ingrid Alexandra's mother, Crown Princess Mette-Marit. 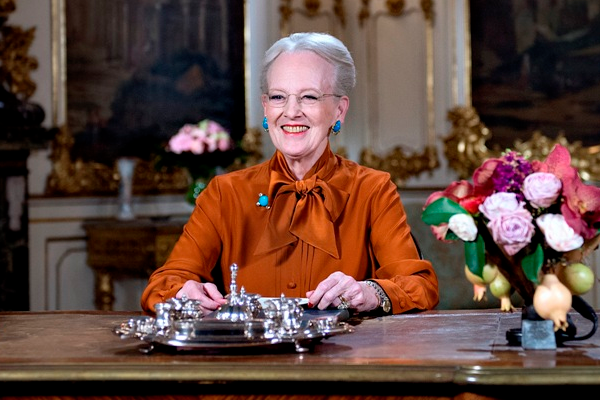 Some of you asked yesterday for more on the sapphires that Queen Margrethe II of Denmark wore at this weekend's Norwegian Silver Jubilee, and I'm more than happy to oblige. Here's a look at various sapphire pieces from the collection of Queen Alexandrine of Denmark, grandmother of the current queen. This versatile set consists of at least three major pieces: a necklace, earrings, and a large brooch. The necklace is adjustable; sections can be removed to make it longer or shorter. Queen Margrethe has in the past used some of the removed sapphire elements as hairpins. She's also worn the necklace with an additional marquise-shaped sapphire and diamond pendant. The entire set comes from Queen Alexandrine, and it's often speculated that it has Russian origins. That would make sense -- Alexandrine's mother, Anastasia, was born a Romanov grand duchess. When Alexandrine owned these sapphires, some of them were mounted in a large corsage ornament, which was broken up to create the set now worn by Margrethe. 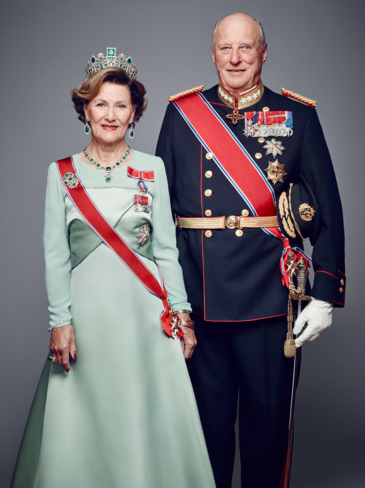 Time for a look at the jewels worn by Queen Sonja and the other ladies who attended King Harald's Silver Jubilee festivities in Norway this weekend! On Saturday, the Norwegian royal family and their guests gathered at Skaugum, the home of Crown Prince Haakon and Crown Princess Mette-Marit. Sonja wore pieces from her collection of modern emerald jewels. 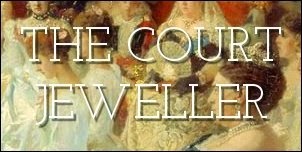 Today is the 25th anniversary of the death of King Olav V of Norway and the accession of his son, King Harald V. To mark King Harald's Silver Jubilee, today we have a very special Sunday edition of our Sparkler series, surveying all of the tiaras currently owned/worn by the ladies of the Norwegian royal family. 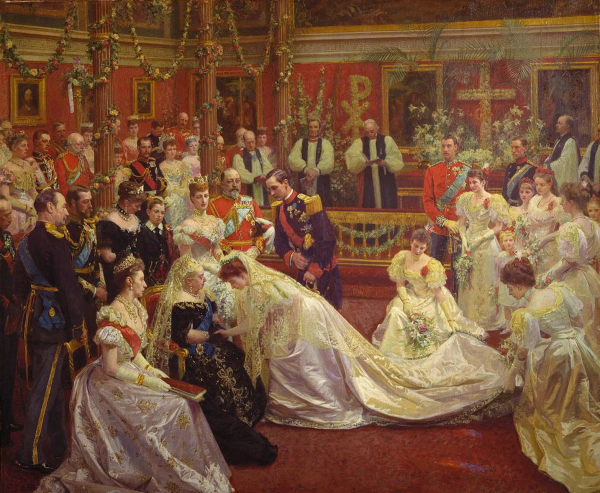 You can read more about each tiara by clicking on the piece's name. Enjoy! Made in the early nineteenth century, this parure of emerald jewels started out with the Leuchtenberg family in Germany. 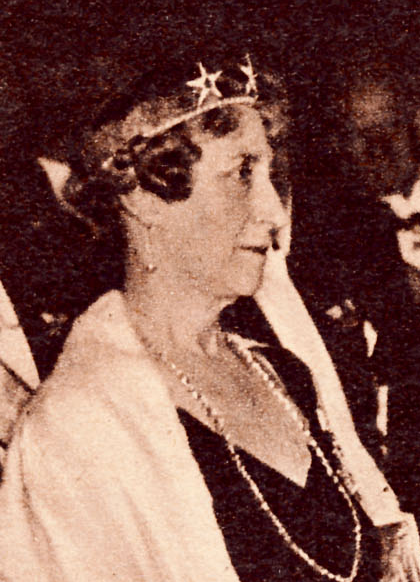 The tiara traveled through the family, moving to Portugal and Sweden, and was eventually inherited by Princess Ingeborg of Sweden. She gave the tiara to her daughter, Crown Princess Martha of Norway, as an insurance policy during her WWII exile to America. After Martha's death, the entire parure was inherited by King Harald. Today, the tiara is worn exclusively by Queen Sonja. The illustrated list of Maud's wedding gifts from the Illustrated London News features the brooch in the lower left-hand corner of the page. 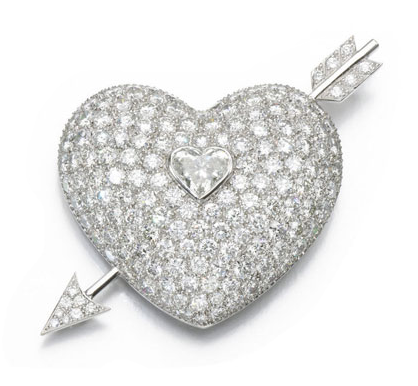 It is described as a "diamond and pearl ornament to be worn as a brooch or pendant." The gift is attributed to the Drapers' Company. In celebration of the upcoming Silver Jubilee of King Harald V of Norway, we're going to look at three of the most important Norwegian royal weddings on the blog this month. First up: a wedding between a Danish prince and a British princess -- who would one day unexpectedly become Norway's king and queen. 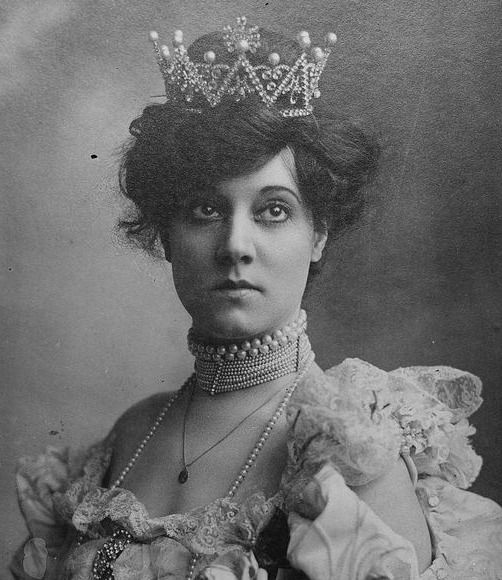 In the 1890s, Princess Maud of Wales was one of the most eligible royal women in Europe. Her parents were the Prince and Princess of Wales, which means, of course, that her grandmother was Queen Victoria. 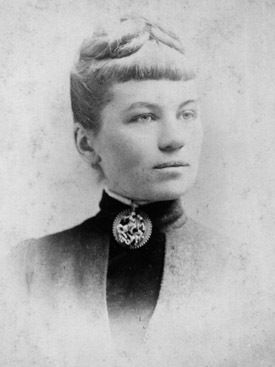 Maud was energetic and spirited, and her name was bandied about as a match for several European princes. But Maud had one prince in particular in mind: Francis of Teck, brother of her sister-in-law, the Duchess of York. Unfortunately for Maud, Francis wasn't interested, and in 1895 she finally settled on a different future husband: Prince Carl of Denmark, the second son of the Danish crown prince. Baltimore -- Governor-elect Frank Brown  will be inaugurated at Annapolis next Wednesday. It had been his intention to celebrate his induction into office with great pomp and ceremony, and elaborate arrangements were in progress, when a jeweler knocked the program into smithereens. 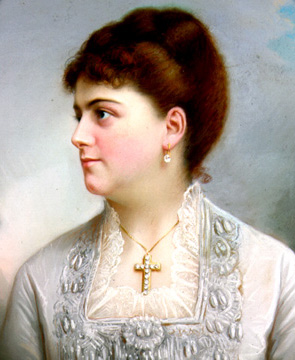 It appears that Mrs. Brown , the governor's wife, who is very wealthy and a leader in society, had sent all her diamonds -- and she has a magnificent collection -- to a jeweler to have them reset and rearranged. She intended wearing them at the reception following the inauguration. 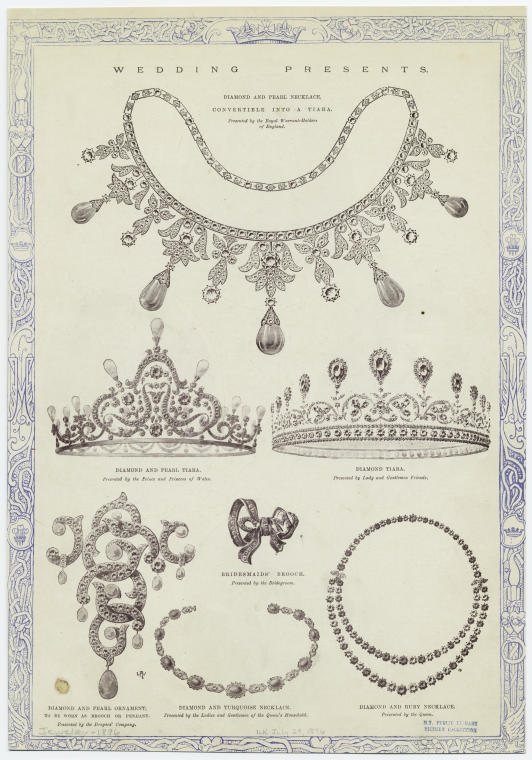 The jeweler conceived the idea of setting them in a band and forming a crown. Mrs. Brown at first objected, but was finally persuaded. 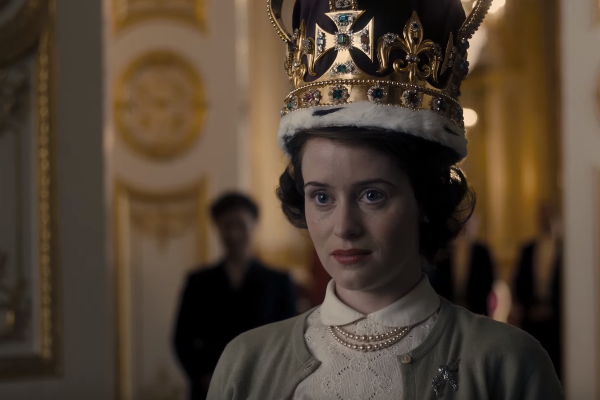 When the work was completed, and before it was submitted to her, the jeweler sent for the newspaper reporters, showed them the tiara, which certainly was beautiful, and stated that it was to be worn by Mrs. Brown when her husband was inaugurated. Kate officially began her royal life wearing this tiara, which was a wedding anniversary gift from King George VI to the Queen Mother. Made by Cartier in 1936, the tiara made of platinum and set with diamonds. In 1953, it attended another important event at Westminster Abbey, when Princess Margaret wore it to her sister's coronation. Kate has only worn the tiara once so far, on her wedding day, but the fact that her new wedding earrings were made to coordinate with the tiara suggests that it may be a long-term loan. Following the tiara-heavy New Year's Levee on January 1 in Copenhagen, two more levees have been attended by the Danish royal family. 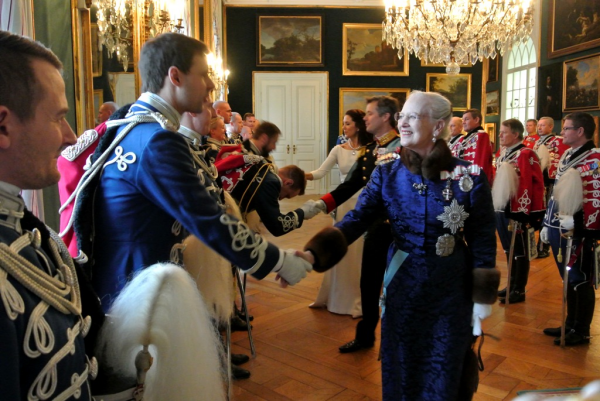 At the January 5th reception, Queen Margrethe pinned a diamond brooch among her order insignia and badges. The Telegraph published an article this week on the jewels of Grace Kelly (aka Princess Grace of Monaco), focusing on the pieces she wore during her engagement and marriage to Prince Rainier. The article highlights jewelry made by two of Grace's favorite jewelry firms: Cartier and Van Cleef and Arpels. Rainier actually purchased two engagement rings from Cartier for Grace. The first was an eternity-style band of alternating diamonds and rubies, mimicking the red and white colors of the Monegasque flag. But the trend for bigger and bigger diamonds in Hollywood convinced Rainier to upgrade to an enormous emerald-cut diamond weighing more than ten carats. 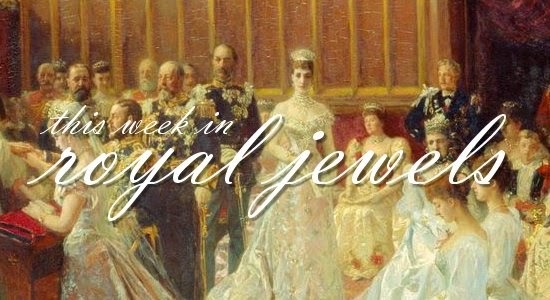 Today I've got two vintage British Pathe film clips for you that feature royal jewelry and jeweled objects. 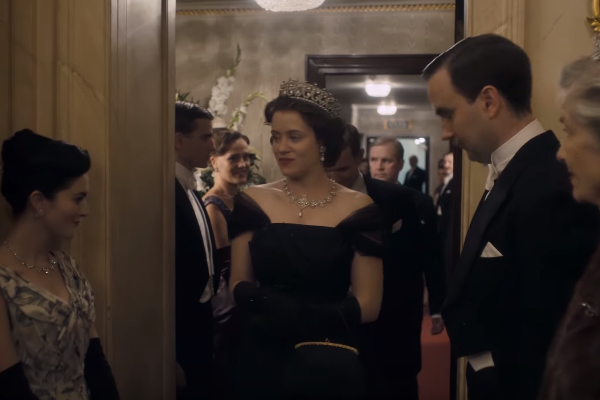 Above, footage from 1950 features several Faberge pieces, including a number of the Romanov imperial eggs and a glimpse of the diamond myrtle wreath tiara from the Westminster collection. Below, 1926 newsreel clips featuring the Russian imperial jewels at the time of the Soviet auction. 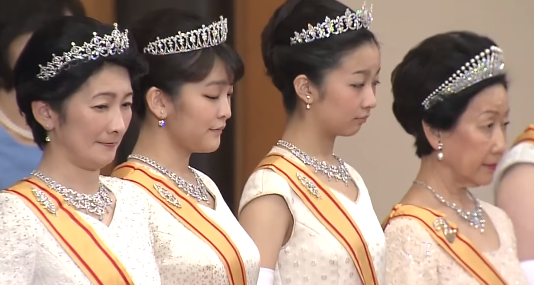 The Japanese imperial family always makes two public appearances at the start of the new year: a glittering evening reception where the ladies wear tiaras and jewels, and a balcony appearance where they don daytime jewelry. Here's a look at the pieces we saw this year as the emperor greeted the people. One of the most glittering days on the Japanese imperial calendar is New Year's Day, when the family gathers for the annual New Year's reception at the palace. The family's traditional diamond and pearl jewels were out in force. 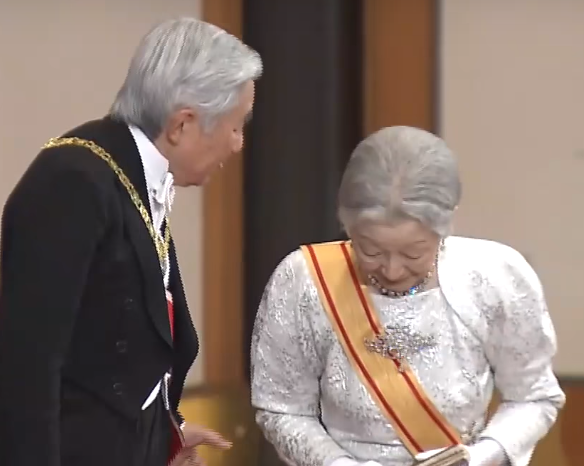 Empress Michiko doesn't wear tiaras anymore, because of medical issues with her head/neck/back, but she added a surprising bit of extra glitter this year in the form of an absolutely enormous brooch. Really, it's probably more accurate to call this a devant de corsage, perhaps a remnant of a nineteenth-century stomacher ornament. 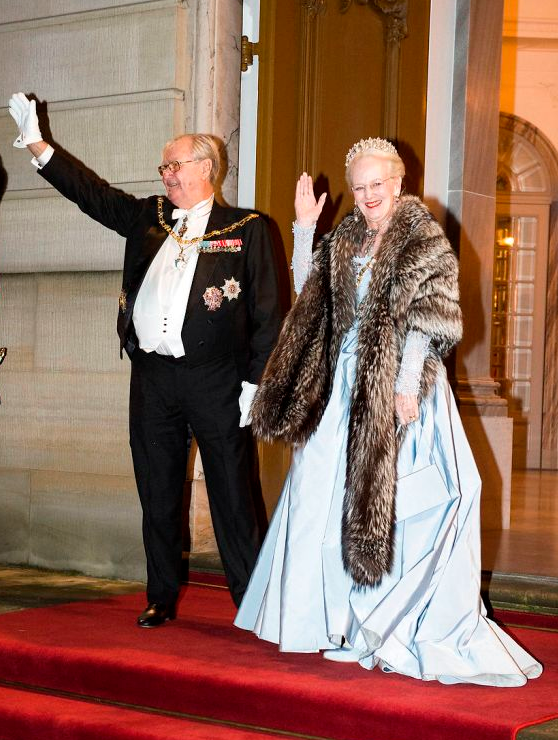 The Danish royals gathered at Amalienborg Palace for the first of the annual New Year's Levees on Friday. Queen Margrethe wore a tiara that has become one of her most-worn pieces: the Pearl Poire Tiara.